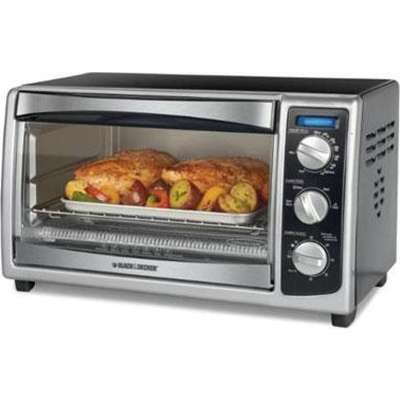 Black & Decker 6-Slice Toaster Oven with Stainless Steel/ Painted finish has a large capacity with convection, bake, broil, toast and keep warm controls! Fits up to 6-Slices or a 9" Pizza. Bake, Broil, Toast, Keep Warm Controls are One-touch functions for a variety of uses; Convection Cooking saves time and energy while cooking; Maximum Bake Temperature 450 degrees F is an energy-efficient alternative to the conventional oven; 60-Minute Timer lets you know when cooking is complete; Bake Pan lets you cook a variety of meals; Dual-Position Rack Slots for placing the rack closer to or farther from the broiler; Removable Crumb Tray for easy cleaning.